I have been asked how I come up with my designs and I let them know it all starts with "The Drawing". All of my metal jewelry designs start with a idea that I have put to paper. I love drawing out my designs because it helps me to visualize how the piece will be put together and in this stage I can work out most of the kinks of the design. While I was in school, both my jewelry teacher and my ceramics teacher always comment on how detailed my drawing were. They had me show my sketch books as part of my displays because of it gave the viewer a complete view point on how my works were thought out and completed. 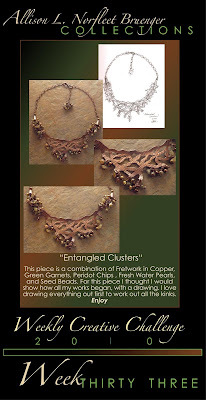 This design " Entangled Clusters" is part of a 4 part series. I designed this piece for the Chesterfield Arts "Art Feast." I was part of an silent auction last night. This is my second year participating in this event. I really appreciate the opportunity to be apart of this event and I love sharing my work with all of you, Have a great Week and Keeping Creating.